Nose, sweet, young and fiery. Wood smoke, Barbecue and cinder. Palette. Young but without being harsh, not too much of a burn considering it’s 53% and I was drinking it neat, some honey, lots of burnt wood, char on a burger that’s been done on the barbecue, corn and herbal note. The finish is medium in length, a little heat, some burnt sugar and more of that wonderful charring. 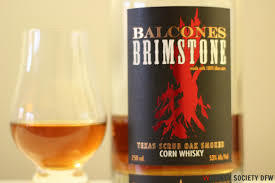 This is a cracking dram, a young tasting, punchy whiskey with a great mixture of smoke and sweetness and here’s a little note for you, a friend had a whiff and a sip, she’s not a big whiskey drinker but just said “reminds me of camping in America” I don’t think Balcones would mind that analogy. Previous And now for something completely different.